In the spring of 1956, after students Wilhelmina Jakes and Carrie Patterson from Florida A&M University, were arrested and jailed for refusing to leave the “whites only” section of a Tallahassee bus, the African-American community of the city rallied together to boycott the city bus service and take a stand for their civil rights and the belief that the color of their skin should not leave them subject to discrimination and fear. Those who participated in the boycott, including Rev. C.K. Steele, Daniel Speed, Jakes and Patterson and many others from the then 10,600 African-American residents of Tallahassee, were met with resistance from bigoted members of the Tallahassee community that felt racial segregation should remain the law of the land. What factors contributed to a mindset that would allow for one group to so poorly treat another? A new exhibit now open at the Claude Pepper Library seeks to illustrate the kind of resistance that the Bus Boycott participants faced in their endeavors to secure fair and impartial treatment in a city that they too, called home. Guests are invited to visit the Claude Pepper Library and explore the exhibit on the Tallahassee Bus Boycott of 1956 which is open to the public now, through the early fall of 2018. Using primary source documents, ephemera and photographs that provide a deeper context for the events that began to take place in May of 1956, Special Collections & Archives provides a look into the social and political climate in the State of Florida leading during the time of the Bus Boycott. Guests are also able to listen to audio recordings of boycott participants and witnesses, including the Reverend C.K. Steele, Daniel Speed and Governor LeRoy Collins. The Claude Pepper Library and Museum are open Monday through Friday from 9:00AM to 5:00PM, call (850) 644-9217 or email Political Papers Archivist Robert Rubero (rrubero@fsu.edu) with any questions. 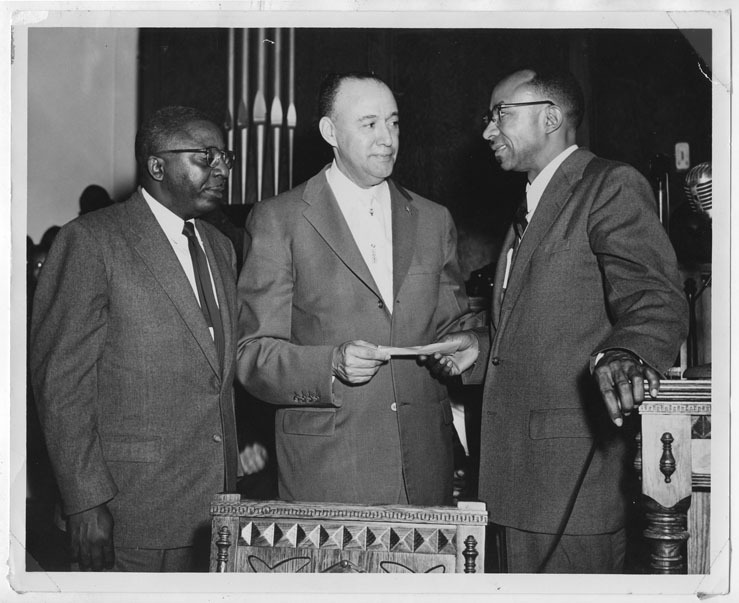 Virgil Hawkins, J. Raymond Henderson, and C.K. Steele, circa 1955. From 00/MSS 2006-013.